Sleepy ah...Whose fault is it? Mamarazzi loh. Who else. Mamarazzi was burning midnight oil again. A few weeks ago, she got this book from BookXcess. 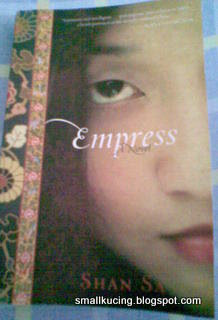 This book is about a little girl who grew up to be Emperor. Ya...though the title is Empress but her highest post was as an Emperor. Most of the people misunderstood her and called her the Dragon Lady and think of her as an evil woman. In this book she was portrayed as a nice lady who did what she had to do to survive. Even let herself be blamed for many things that she didn't do and not her fault. The ending is rather sad. As I've said earlier, Mamarazzi got this book from BookXcess, if not mistaken it's RM17-90. If you want to get a copy, you've better run to BookXcess fast. It's easy to check what sort of books BookXcess have. You just need to go into www.bookxcessblog.com. A very interesting website for bookworms like Mamarazzi. Everyday, she would pop by the website and check out the blog. Some times they have book reviews by their staffs. And the reviews are real interesting too. Wow! how many bookstore can boast that their staffs really read the books that they sells? Some book stores, when you ask their staffs about a book they would just look at you with a blank look. Apart from that they also have weekly Blog Bonanza contest and some times they give out free books too. Hmmm...you know what would have made the Bookxcess Blog perfect? A "Wish List". If only they put in a Wish List for it's member to list down the books they wanted. When their birthday or Christmas or on Special Occassion, friends and family could just pop over to BookXcess and get the perfect gift for bookworms like Mamarazzi. Also BookXcess would have known what sort of books are in demand. Well, that's all about BookXcessblog.com. Back to the topic, EMPRESS. It's really a good book.Must buy. But don't say I didn't warn you. If you buy, you might end up burning midnight oil and having Panda Eyes like Mamarazzi. Hey! BookXcess, why not consider giving free Facial Treatment vouchers or Brands Chicken Essence for the next Blog Bonanza? Helps those bookworms like Mamarazzi to stay pretty and fit while burning midnight oil.